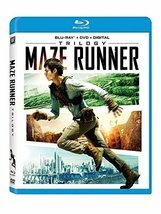 The Maze Runner- In this heart-pounding thriller based on the best-selling novel, a teenager named Thomas (Dylan O'Brien) is trapped in a massive, ever-changing labyrinth with a group of boys who have no memory of their past. Maze Runner: The Scorch Trials- After escaping from the Maze, Thomas and his fellow Gladers now face a greater challenge: crossing a desolate wasteland, filled with hidden dangers, to search for clues about the secret organization known as WCKD. Maze Runner: The Death Cure- In the epic conclusion to the Maze Runner trilogy, Thomas leads the Gladers on their final mission. To save their friends, they must break into the legendary Last City, which turns out to be the deadliest maze of all!